Monterey County Gives! brings together donors big and small to support local nonprofits and their Big Ideas. Monterey County Gives! is here—nonprofits have submitted their applications highlighting their Big Idea for this year, website retooling is complete, challenge grants are in place and now we’re ready to hit go and let the donors of Monterey County demonstrate their remarkable support for the great work of our 169 participating agencies. MCGives! has grown every year of its existence, since launching in 2009. Last year, a whopping $4.8 million was given and granted. Challenge grants were the highest ever, as was the pool of matching funds. Nonprofits are getting savvier each year in their ability to motivate their donors to contribute through MCGives! 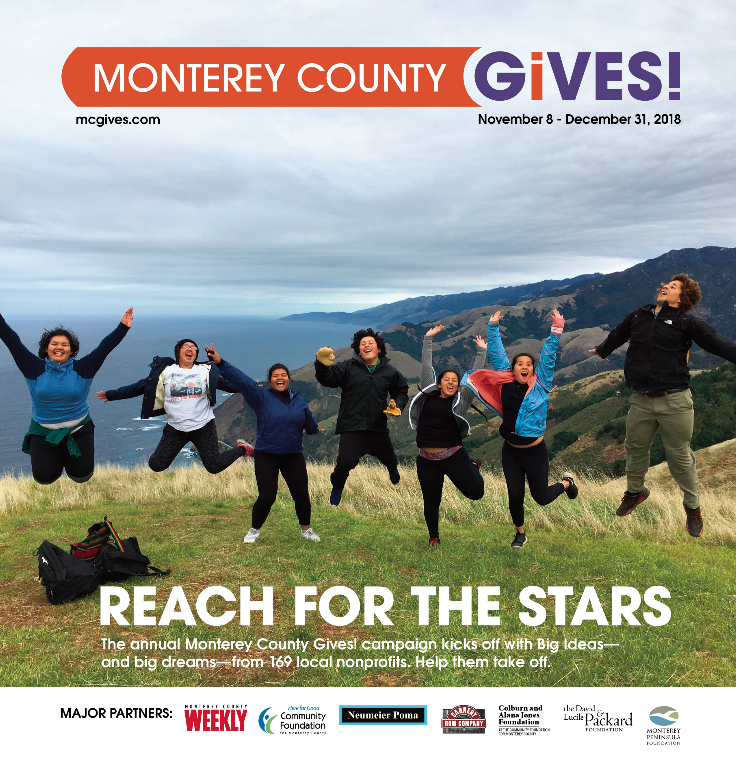 The partnership of the Monterey County Weekly, Community Foundation for Monterey County and the Monterey Peninsula Foundation has never been stronger, as well as our collective resolve to make MCGives! bigger and better every year. Then there was the 2017 Tax Act. What? We’re collectively learning what the changes may bring to the nonprofit community. The 2017 Tax Act standard deduction will move many taxpayers away from itemizing donations on their tax returns. In addition, the new caps on total deductions (including state and local taxes) may also impact how we make our philanthropic decisions. Some predictions on the impact on charitable giving nationally have been dire. When we began to digest the details of the Tax Act, the first thing that came to mind was Monterey County Gives! and what it might mean for donations. The question boils down to what drives giving. How much does the psychological boost of knowing a gift is tax-deductible play into one’s desire to use charitable giving as a way to reinvest in our communities? (Remember that deductions aren’t credits, so “taking it off my taxes” actually means lowering my taxes by about 25-percent of the value of a gift). Will donors get hung up on this? We hope not. Our belief is that if Monterey County Gives! has shown us anything it is that giving is being driven by the knowledge that our communities are much better places because of the outstanding work of our nonprofits. Your gift matters, however big or small, and it matters even more during the MCGives! campaign. Our suggestion, whether it appears on your tax returns or not: give!